It's April! I can't really believe it, but I'm definitely happy about it! I love spring, the warmer temperatures, and the trees and flowers budding all around. March was a hard month for me, and I'm ready to leave it behind and start something new. We've been enjoying the bright yellow tulips we brought home from church on Sunday. I wish tulips would last longer than a week! Speaking of yellow flowers, our forsythia bushes bloomed this week! I think it is a few weeks earlier than previous years, so it surprised us. They really brighten up our yard (and our house)! Our Ivy girl. I guess Crocs make for good pillows! On Wednesday, the boys and I went on one of our big shopping trips. It's about an hour's drive, and it was a beautiful sunny day, so I figured we should go for it! We found some summer clothes for the boys, and we were distracted by approximately 1,000 other droolworthy Target things. After Target, I wanted to go to Ulta because I had a gift card, along with a long list of products to look at. It was kind of a disaster. Ephraim got gobs of sample lipstick all over his hands (and then my jacket), and Nolan touched and misplaced every item at his level in the store. Mama got to go home with a couple things, so it wasn't a total bust. But I probably can't take them in there again! We had to stop at Wegman's afterward so that the boys could ride in a "car" cart. They checked out the lobsters, yelled "beep beep" many times, and got so excited to watch the toy train that runs up above the dairy section. It was way past E's naptime, so it was time to head home! My friend Meghan found this Chase sweatshirt for Ephraim's birthday. It is complete with ears, a hat, and see-through eyes. It's for a true Paw Patrol lover! Our town doesn't have a place for recycling magazines, and I had a huge stack, so yesterday we drove to the next town over. We stopped at a small grocery store while we were there, and we got so excited to find mini carts! We've never seen these before at a store, so it was a BIG deal for the boys. At first they fought over sharing one cart, so we went back and got a second one. They were doing so well for a few minutes (and they looked so cute!) But then they started getting upset about who got to put the stuff in which cart. This led to huge meltdowns by both of them. Ephraim laid down on the floor, sobbing. I was trying to walk away to show him that he wasn't getting anywhere with me, and then Nolan started screaming that he didn't want to leave Ephraim at the store. Ahh! I basically dragged them out of the store. Motherhood is not for the faint of heart. Steve has been busy painting our fourth bedroom this week! It's one of those, "Why didn't we do this sooner??" things because we love it so much! A few of you asked about my mint dress from Easter. . . I bought it from Groopdealz a couple of weeks ago. I always browse the site for tops and dresses by Lucy & Lyla. :) I may have this same dress in a few colors because they're so comfortable and easy to throw on before church. I think this one was $12.99, and I'm hoping they'll have the short sleeve version out soon! Have a fantastic weekend, you guys! See you back here on Monday. P.S. 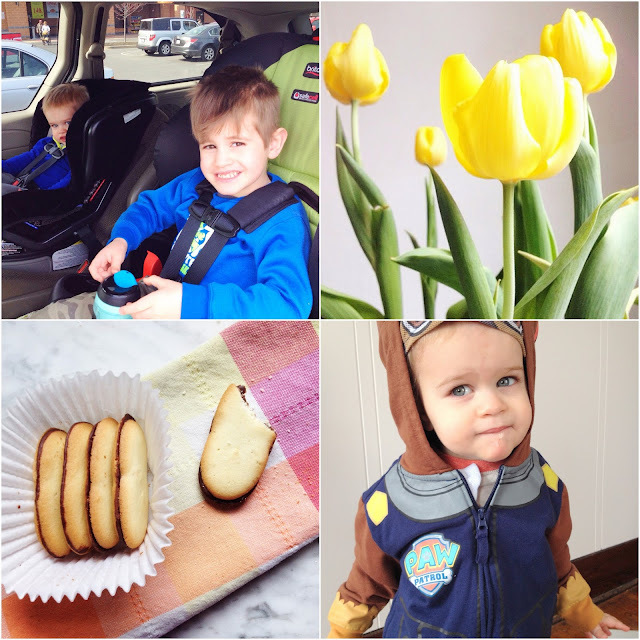 Astleigh and I have an Instagram challenge every week #thedarlingdetails. This week's topic is #blooms! Share a photo of some gorgeous flowers, tag us, and use our hashtags! We'll choose one photo to post on our feeds later today! I love the story of grocery store and the carts + Nolan being upset at the thought of leaving E behind! Funny now, but I bet it wasn't when it was happening :) Have a great weekend! Happy April!! Really love the variety of fresh cut options for Flower Delivery. Last purchase were Iris stems and peonies and the arrangement lasted for a lot longer than I expected. There are also some pre-arranged options which are also great.